Endangered Species Monday: Papustyla pulcherrima | Special Report. Manus Green Tree Snail – Very first invertebrate to be listed on the Endangered Species Act of the United States of America (2015) Endangered Species Post Special Report. This Monday’s Endangered Species Post (ESP) I take a wee glimpse into the life of the Green Tree Snail, also commonly known by Papua New Guinea’s natives as the Manus Green Tree Snail. Image Credit: Stephen J. Richards. Identified by Professor Rensch 1931, Rensch was born on the 21st January 1900 in Thale in Harz and died on the 4th April 1990 in Münster, (Germany), Professor Rensch was an evolutionary biologist, zoologist, ethologist, neurophysiologist and philosopher and co-founder of the synthetic theory of evolution. He was professor of Zoology and Director of the Zoological Institute at the Westphalian Wilhelms University in Münster. Together with his wife Mme Ilse Rensch he also worked in the field of Malacology and described several new species and subspecies of land snails. The Manus Green Tree Snail is identified as Papustyla pulcherrima commonly known as the Emerald Green Snail. From 1983-1994 this particular species of snail was considered (extremely rare). Back in 1996 when scientists managed to again finally catch up with this stunning little mollusk, the species was then listed as (data deficient) of which to date there remains little information about this (rare) but beautiful snail. P. pulcherrima is endemic to the Papa New Guinea northern island of Manus of which the species is listed as (near threatened), and has also been reported on the adjacent Los Negros Island. Environmental scientists have confirmed from villagers on the main Manus Island that the species is not located anywhere else. However there are some sketchy reports that the species “may be located on surrounding islands”, however there is no evidence to back these claims up. Environmental scientists have confirmed for now that the species is located in only 12-13 areas of the Manus Island[s]. Further reports have confirmed that mature individuals are on the decline (which if not controlled could evidently see the species re-listed as vulnerable or endangered). The Manus Green Tree Snail is not believed to be living within fragmented zones. The species is restricted to forest and low intensity garden ‘type’ habitat. Declines have been noted within all 12-13 identified habitats on the Manus Island and adjacent Los Negros Islands. Population history is pretty much undocumented although has been shown to be slowly declining. Image: Manus Green Tree Snail. Back in 1930 when Professor Rensch identified the Manus Green Tree Snail, locals soon began collecting the species for trade thus seeing the mollusk now nearing endangered listing. Demand for the Manus Green Tree Snail has now drastically increased threatening the species furthermore. Locals continue to collect this rather unusual colored species shell for use within the jewelry trade. There are now “very serious concerns” that trade may eventually push the species into extinction. Due to mass trade exploitation the Manus Green Tree Snail is the very first invertebrate to be listed on the Endangered Species Act of the United States of America. International trade has been controlled by export permit since 1975 under the Convention on International Trade in Endangered Species of Wild Fauna and Flora (CITES) appendix II. Unfortunately this is not stopping locals from harvesting the species, and trade is still continuing despite it now a criminal offence under United States and some international laws. Market sales data collected from the Lorengau market, over a six day period suggest that annual sales at the market may approach 5,000 shells. Investigations by the Wildlife Conservation Society (WCS) reveal that large quantities of shells are still being attempted to be exported out of the country. Online searches revealed the sale of the shells, often marketed as antiques, occurring in open forums and internet market places based in New Zealand, Australia, and the United States of America (USA). International Animal Rescue Foundation has ran numerous traces online of which located yet again Ebay as being a number one trading site of the “threatened species”, please view the image below and click the image link that’ll direct you to that site. International Animal Rescue Foundation’s External Affairs Department and the Environmental Cyber Crimes Unit located many a sites trading the Manus Green Tree Snail’s shell which is illegal under some trade law, unfortunately the Ebay site listed above, located within Japan is one of many more that are trading (despite the species nearing extinction). I.A.R.F’s Environmental Cyber Crimes Unit have since filed a complaint with Ebay, providing all the relevant data to now remove these species from their sites, however its likely to prove negative as the trader could very well state they harvested or purchased the shells before international laws were drafted. Furthermore a trace of the owner that owns this site above which is in violation of the United States and Cites laws (is located within the United States). So in regards to enforcement, breaking this link is going to be somewhat of a tough cookie. Further trade was witnessed here via what we can only believe is alleged “antiques”. Further trade all of which is illegal has been recorded hereto – this site linked back to a Mr Rob West of 121 Henderson Road, Sheldon, Brisbane, Queensland 4157 Australia, Telephone: 610732061636. Mr West from Brisbane categorically states that he doesn’t own a shop, and is a one man band, yet clearly this link states otherwise. Further evidence revealed antique trade conducted on the Ebay site, see in the image below (illegal under United States law). Click the image link below to view more. It is possible the avoidance of conventional nomenclature is an attempt to avoid detection by authorities. In some cases, sellers on internet market places were based in CITES signatory countries (including: Australia, Italy, New Zealand, Singapore and USA) while others were not (e.g. Taiwan). Currently, volumes of shells on sale in such online market places appear low, suggesting that the existing controls on international trade maybe adequate. However, given that the online prices of shells were often orders of magnitude greater than market prices on Manus Island, vigilance will be required to insure that illegal international demand does not fuel a resurgence in snail collection. Despite the massive trade on Manus Green Tree Snails online and within open Asian markets, its literally impossible to determine if this trade will eventually lead to the species being pushed into extinction. However it MUST be noted that there are currently only 12-13 identified habitats that the snail currently inhabits. And based on traces online conducted by the I.A.R.F’s External Affairs Department – trade is most certainly “out of control”, and not as Cites has reported (2012). The shell of this species is a vivid green color, which is unusual in snails. The green color is however not within the solid, calcium carbonate part of the shell but instead it is a very thin protein layer known as the periostracum. Under the periostracum the shell is yellow. 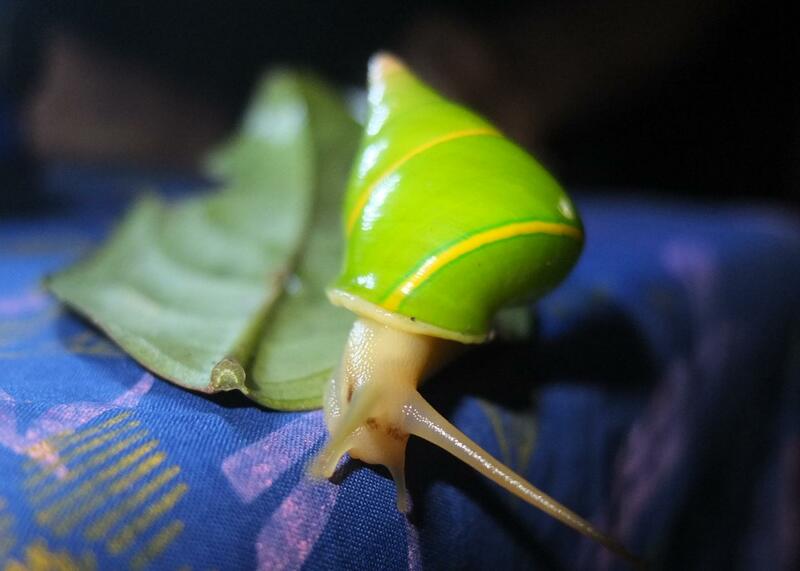 The Manus Green Tree Snail is mostly threatened by habitat destruction through forest clearance: logging, plantation development (especially rubber) and to a lesser extent road developments. Increasing human population growth and an increasing cultural demand for deriving cash incomes from the land will likely see the rate of forest degradation increase in the future. Harvest occurs when trees are felled as part of traditional shifting cultivation and the snails, typically found in the canopy, suddenly become exposed. Such harvesting is not uncommon but it is likely to be of lower significance than the longer term habitat degradation caused by such agricultural practices. While harvest for illicit international trade is occurring, the volumes are not “allegedly” thought to be large compared to historic rates, although they may approach levels seen in the legal domestic trade. However, given that the prices of shells internationally are often orders of magnitude greater than market prices on Manus Island, vigilance will be required to insure that illegal international demand does not fuel a resurgence in snail collection. Notable deposits of gold have been found in central Manus and a mine operation will likely result in the next decade although no details of the plan have been released (as of 2014). The forests of Manus Island were badly affected by the 1997-1998 El Niño which resulted in a prolonged drought. Should climatic change result in increased rates of similar conditions this may constitute a future threat to the snail species, however, current predictions suggest that future incidence of drought in Papua New Guinea will decrease (Australian Bureau of Metrology and CSIRO 2011). Despite the reassurances from Cites, WCS and the local wildlife organisations – evidence clearly points to large scale online trade legal and illegal. Furthermore there is no telling if shells online are antique or smuggled from the Manus Islands which is very concerning. 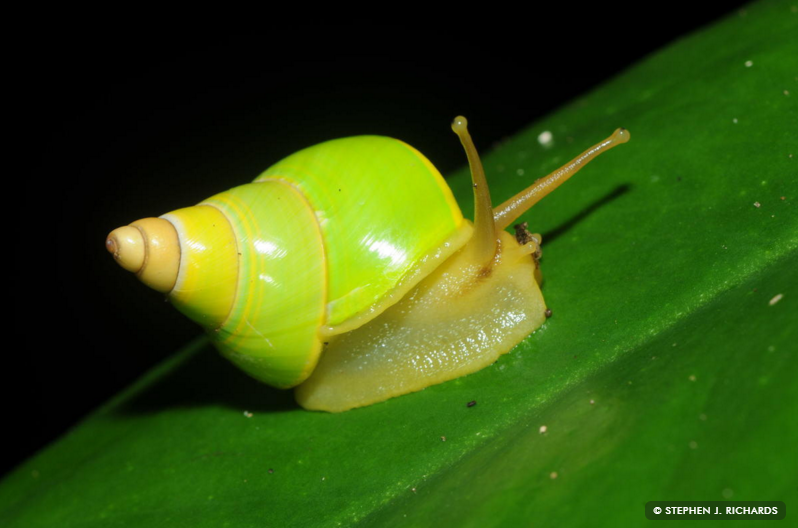 Manus Green Tree Snail is the first such snail to be listed on the threatened list of endangered species (USA). Research also explains to us that its likely the species will be plundered into extinction – very soon. Enjoy the video. Thank you for reading, and please be most kind to share to create awareness and education. This entry was posted on January 18, 2016 by speakupforthevoiceless. It was filed under You must be the change you want to see in the world and was tagged with Africa, and the United States of America (USA), animal parts trade, Australia, Brisbane, Cites, Data Deficient, Depre, Dr Jose Depre, Ebay, Emerald Green Snail, Endangered, Endangered Species Act of the United States of America, Endangered Species Post, Environmental Cyber Crimes Unit, External Affairs Department, Friday, Happy Monday Animal, Henderson Road, I.A.R.F, International Animal Rescue Foundation, invertebrate, Italy, IUCN, Japan, Jose Depre, Los Negros Islands, Manus, Manus Green Tree Snail, Manus Island, Manus Tree Snail, Mollusks, Monday, Monday's animal, New Zealand, Papa New Guinea, Papustyla pulcherrima, Professor Rensch, Queensland, Rob West, Saturday, Sheldon, Singapore, Snails, Special Report, Sunday, Taiwan, Thursday, Tuesday, WCS, Wednesday.